A co-worker of mine got married and I offered to make a cake for him. Not the wedding cake, mind you, as I’m no expert and the thought sends shivers up my spine. I like making fun cakes that seem more appropriate for little kids because they think everything is great so long as it is sweet. 🙂 I don’t think I could ever make a wedding cake…except perhaps, my own, only because the pressure of delivering a perfect, beautiful cake would drive me crazy. The couple had their wedding in the east coast and wanted to throw a small party for their friends here to celebrate. So, being that my co-worker works at Apple and his wife used to work for Apple, I decided to make an orange cake. Just kidding. Of course I made them an Apple cake. 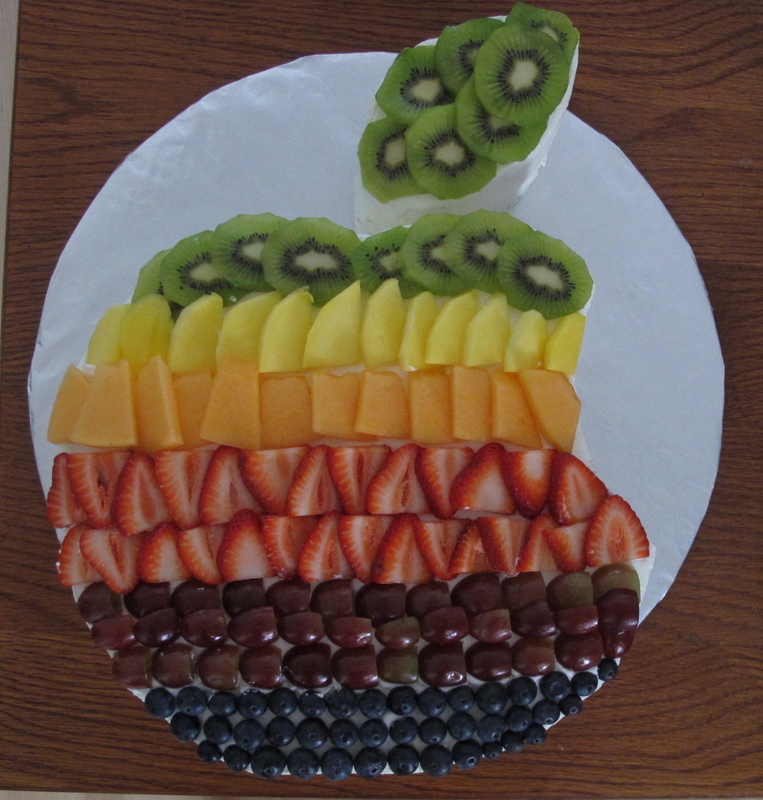 I was debating for some time whether I should use food coloring to match the old Apple rainbow colored logo, but then decided last minute to “think different” and use fresh fruits instead. I thought it would fit nicely with a fruity theme and have it be refreshing as well. To make the cake, I used a 15″ round cake pan. I took a large card stock sheet of paper and sketched out the Apple logo. This took a couple of tries as I don’t have a printer that can print something that big, so had to use bowls, and whatever I had on hand, to try and create the Apple logo. 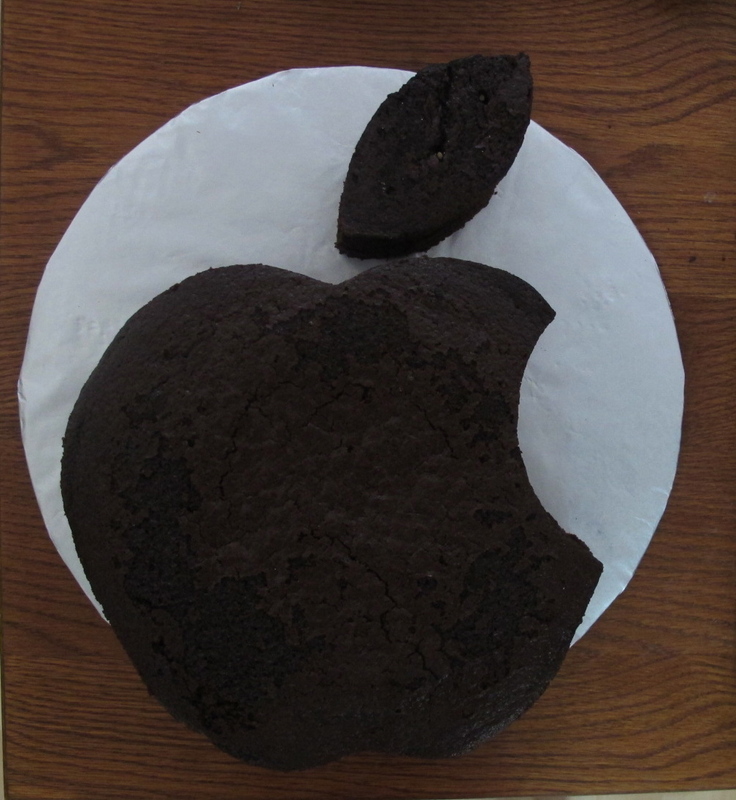 After the cake cooled, I cut out the logo using my stencil and used the piece I cut out (that simulates the byte out of the apple) as the leaf on top. That is not quite exact if you look at the logo, but it was good enough for my cake. See why I say I can never make a wedding cake? Here is what the chocolate cake looked like after I cut it using the stencil. I iced the cake with fresh whipped cream. To give the Apple cake some color, I sliced kiwis for the green, mangoes for the yellow, cantaloupe for the orange, strawberries for the red, grapes for the purple, and blueberries for the blue. The fruits and whipped cream actually paired very well with the chocolate cake. I’m so behind, I know! Thanks to those who keep checking back now and again… I will post the fire truck cake directions soon as I’ve been getting many requests, but please give me some time. I just started a new job and therefore falling behind on everything else! Now where was I? 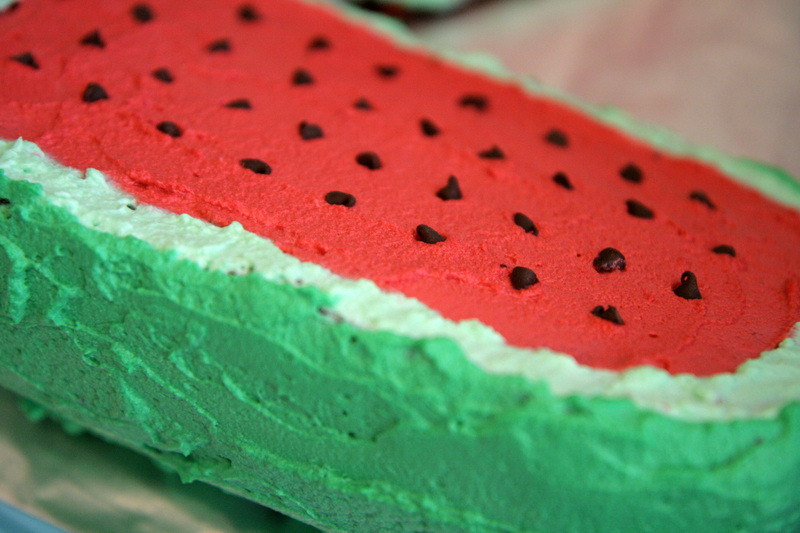 This summer was a blast with fond memories of my kids stuffing their faces with cold, sweet, juicy watermelon. 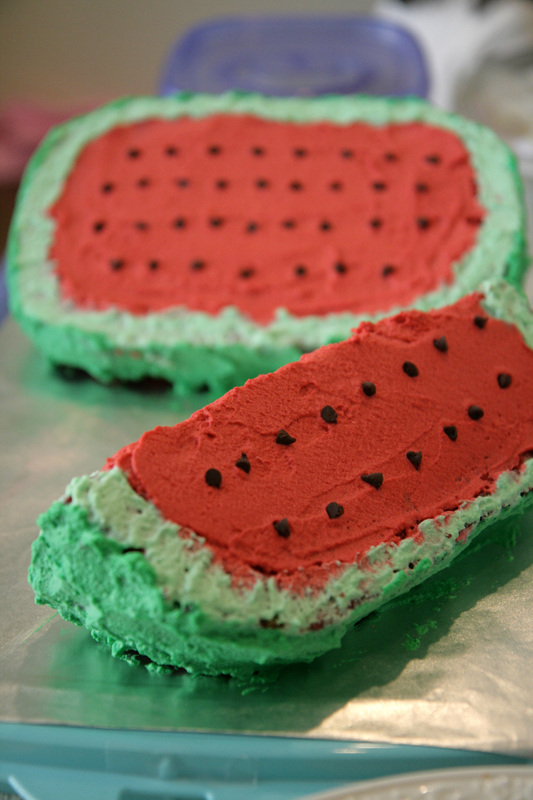 I paid homage to this wonderful fruity goodness with none other than a cake rendition. 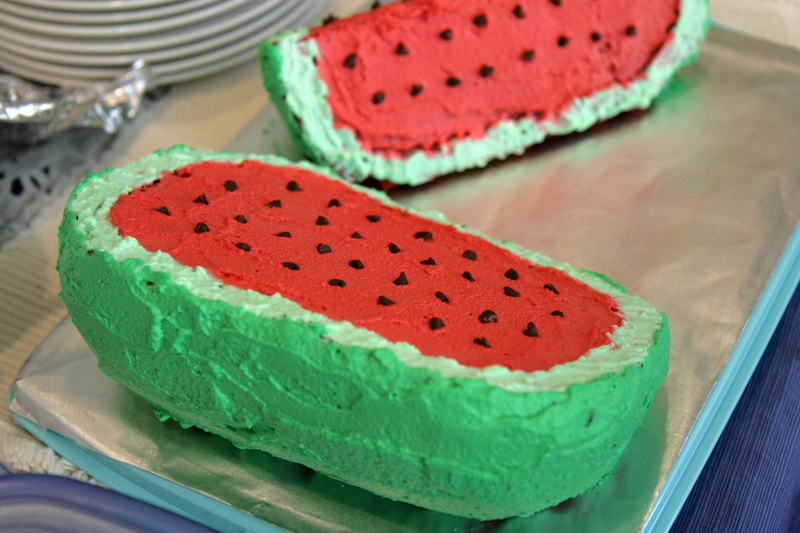 Needless to say, you can make a better looking watermelon cake if you use regular frosting instead of whipped cream as it is harder to get a smooth spread with whipped cream. Then again it could just be me.